Last year I discovered Inov 8, a UK company that mainly specialise in trail running shoes. My training is predominantly a mix of road, trail and beach running so I decided to try the Road X 233 as opposed to a more trail specific shoe. The first thing you notice about Inov 8 running shoes is the bright colours, well built shoes and easy to understand arrow system which allows anyone to easily transition into more minimal running. The Road X 233 is a 6mm drop or 2 arrow on the Inov 8 system. I purchased my Road X 233’s, they arrived a week later and I was very keen to put some miles on them. In terms of fit the Road X has a largish toe box which is great for those transitioning to minimal running as it gives the toes room to find the ground. Otherwise I found them comfortable around the heel and mid foot and at 233 grams or a bit more as mine are size UK 11 light. After a few short runs they were run in and very comfortable to run in whether at speed or on a easy run. They are light and responsive. The last is quite firm and stiff which I like but some may prefer a little more give especially on a firm surface like road. If these are your first step to transitioning I would suggest start with some smaller runs and build up as the 6mm drop is noticeable but will still put more strain on your calves and Achilles than a traditional supportive shoe. Overall I love the Road X 233, they are one of the fastest road shoes I’ve run in. Light, comfortable and extremely durable. I like the room in the toe box that these provide. I’ve put about 200km on them so far including a half marathon and they still feel like they have many miles left in them. For those considering Inov 8 as their shoe of choice, don’t hesitate, the Road X 233 hits the mark nicely. 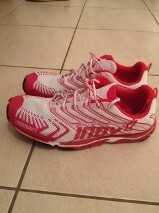 This entry was posted in Reviews, Running and tagged Barefoot Running., inov8, minimalist running, running. Bookmark the permalink.